mad orange fools: Bottle caps, anyone? 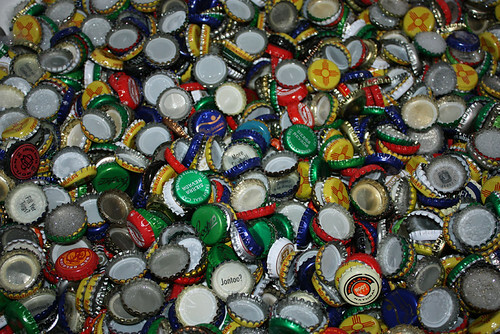 This is probably about a year's worth of bottle caps, more or less. They do get thrown away sometimes. We save them for my mother-in-law and uncle-in-law because they both collect them. They must have garbage bags full from us alone. We drink a lot of beer. Dinner at India Palace last night was excellent. Not quite as good as the place I used to frequent in Pittsburgh (sadly, I can't even remember the name of that place), but pretty damn close. They even had paneer pakora! Yum! And I got to have my beloved matar paneer. Glad to know that we can get good Indian food here. Santa Fe is full of excellent restaurants, but not a whole lot of ethnic choices. Anyway, the company was quite enjoyable too. I got to check out the Canon EOS 50D which is a monster compared to my XSi. It blew my mind. The sun is just starting to come up over the houses now and I need to get motivated to run soon. These "18 feels like 10 degrees" are not my favorite. Brrrrrr! I need to focus on knitting today since I haven't been able to get much done all week. Later, mom and dad are coming over for dinner so dad can watch the Cowboys vs. Ravens game. And then more football tomorrow with our game vs. the Titans. See you on Game Day. I think the Indian place was called "People's"...so good.